Slide-in design provides quick & easy graphic changes! 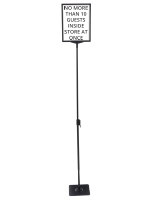 Telescoping pole allows sign to be displayed anywhere between 37" and 60" high! Black expanded PVC backer keeps signs from sagging, or holds vinyl lettering for a permanent message! These sign displays are a perfect way to communicate simple, straightforward messages to customers or patrons in restaurants, retail stores, museums, cafeterias and more. 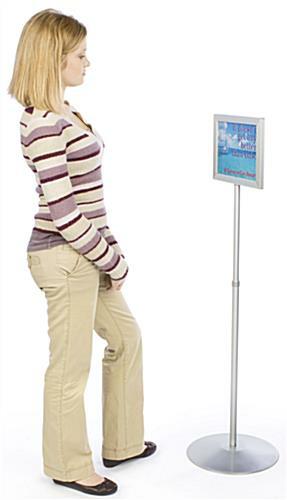 Almost all commercial businesses are in need of signage stands at some point in time. 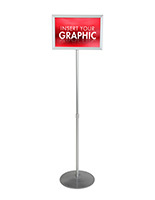 Some are used constantly (such as a restaurant displaying a 'Please Wait To Be Seated' sign), while others have sign displays to use only when needed (to communicate 'Wet Floor' or 'Performance Sold Out'). 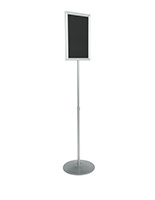 These affordable sign displays, also known as sign holders, are crafted from a satin silver finish anodized aluminum and feature a 1" diameter telescoping pole, so your message can be displayed anywhere between 37" and 60" high. 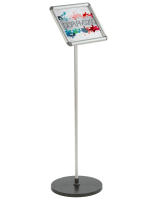 The poster holders, sign displays feature a simple, slide-in design; no hardware or force needed to change out your sign. 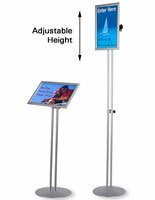 These double-sided sign displays hold up to two standard 11" wide by 8.5" high landscape orientation signs. Signs can be printed right off your business printer, so you don't need to have a small run done at a sign shop. Change your message as often as you'd like by just printing a new one! 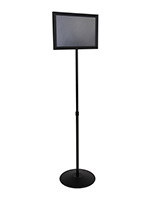 The sign displays include (2) non-glare plastic lenses to ensure your messages are readable from all angles, as well as a black expanded PVC backer so your messages don't sag or "droop". The black expanded PVC backer can also be brought to your local sign shop to have custom vinyl lettering applied, to create a more permanent message. This vinyl message can always be covered by a printed sign whenever it is not needed. 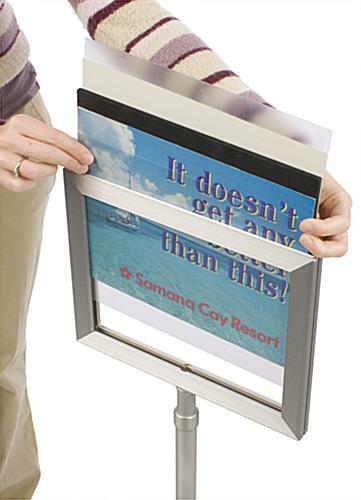 These sign displays are shipped unassembled to lower shipping costs. All necessary hardware and instructions are included for simple, one person assembly. 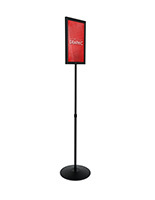 Please Note: Although these are 11" x 8.5" sign displays, please allow .5" on each side of your poster or advertisement to be covered by the metal frame. Frame channel does not accept any materials thicker than standard poster material. Can only be mounted in landscape orientation. We absolutely love this product. 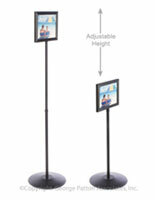 We have now ordered several and use them daily from directing guests, announcements, and general information. These are great! I was looking for a modern looking way to display some guidance signs. This display looks really great and is easy to put together. I would recommend it highly.